Submitted by Taps Coogan on the 11th of July 2018 to The Sounding Line. Allianz chief economic advisor Mohamed El-Erian recently spoke with CNBC to discuss the ongoing trade dispute between the US and the rest of the world. Contrary to the apocalyptic narrative being advanced in most media coverage of the trade dispute, El-Erian points out that there is a real possibility of a positive outcome, particularly for the US. USA is poised to win a trade war, says Allianz’ Mohamed El-Erian from CNBC. 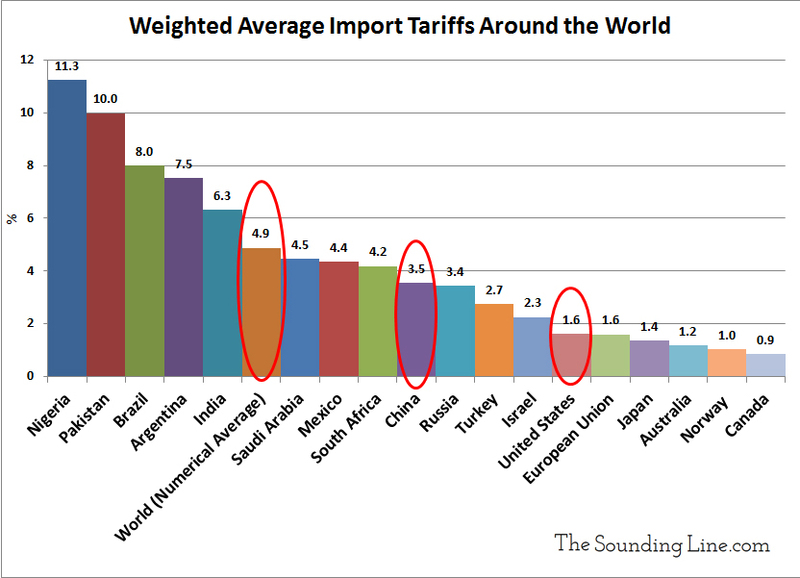 As we have noted here at The Sounding Line on several occasions, international trade is significantly less important to the US economy than it is to every single one of its largest trading partners and because the US runs such large trade deficits with nearly every one of its trading partners, it can always threaten to impose more tariffs than vice-versa. Furthermore, it is disingenuous to imply that the US is starting a trade war with countries like China, which have long imposed far higher import duties, stricter non-tariffs trade barriers, stolen intellectual property, and maintain massive trade surpluses. The objective of US tariff threats is primary to encourage other countries to lower their tariffs and restrictions to the same level as the US. This view is best exemplified by the US proposal to eliminate all automobile tariffs between the US (which charges 2.5% tariffs) and the EU (which charges 10% tariffs). The infamous Smoot-Hawley tariffs that the US imposed in 1930, which are widely believed to have contributed to the Great Depression, were done when the US was the largest exporter in the world, the complete opposite of the current situation, and not a particularly relevant historical analogue. There is more to the interview, so enjoy it above. Interesting. In fact the net energy flows entering Europe since 2008 has been steadily doing DOWN. GDP is correlated at 99% with oil consumption. Guess why we are struggling with our GDP. Shale oil is a scam. Heavy oil EROIE is about 4:1, barely enough to produce food on a large scale. You want to know our future? Read this https://medium.com/@albertbates/peak-mexico-6e34687817c2. In fact it’s not even our future. We might already be there, and maybe 2008 was only the result of the end of our industrial era started in the 19th century when fossil fuel were discovered. El-Erian may be correct in his final assessment but there would be major upheavals within industrial sectors as well as financial/monetary/capital flow turmoil created in many debt ridden economies. Yes, there would be winners, but many losers with a distinct possibility for an international credit meltdown. President “Regan?” Come on, get a proofreader. And this – the US will prevail because it’s a less open economy…- should be MORE open, right? Thanks for catching the Reagan error. Much appreciated. I have corrected it. Less open economy is not a mistake. In this context, by less open El-Erian means less dependent of international trade and more reliant on domestic consumption. Questions That Should Make You Worried: Are Economic Depressions a Thing of Past? Bob Moriarty: Who Says They Don’t Ring a Bell at the Top? The Slowdown That Never Was? China’s Green Light on Coal Power Won’t Trigger New Plant Boom?